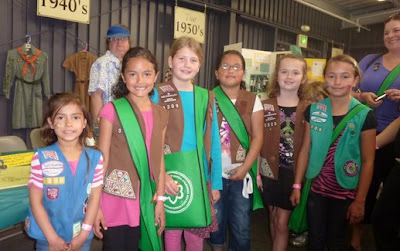 The Modesto Bee reports that Girl Scouts Heart of Central California recently celebrated its centennial by turning the Cal Expo fairgrounds in Sacramento into a Girl Scouts-themed universe for the sold-out event "Girl Scouts 100th: Celebrating Green Forever." Thousands of regional Girl Scouts and their families converged at Cal Expo to explore all of what Girl Scouting has to offer from the past, present and in the future. The event was hosted by Girl Scouts Heart of Central California and featured seven themed "worlds" filled with interactive displays, hands-on activities, projects and entertainment by more than 200 exhibitors. There were science demos and activities, a huge historical exhibit, wildlife tours, dance and drum performances, obstacle courses, speeches by girls, music showcases, art exhibits, petting zoos, craft projects, horse shows and more. Community service and environmental projects were sprinkled throughout the event. In one area, girls could donate used cell phones to those in need of emergency phones. They also recycled and repurposed their clothes by taking part in a "green glamour" fashion swap.